Former classmates Jake Longoria and Atsuo Chiu, ’18, have made their gap years count. Longoria has befriended celebrities, gotten an office job and started a fashion company; Chiu is studying for entrance exams at Japanese universities. Although Longoria said he didn’t plan on taking a gap year as a junior, he knew midway in his senior year that he’d delay college enrollment to innovate and solve problems. “The first thing I explored was a PG (post-graduate) year, which is a more traditional gap year — mostly for athletes,” Longoria said. Several boarding schools with a post-graduate year, such as The Lawrenceville (N.J.) School, invited Longoria to tour the campus. “But I wasn’t a fan of that old-school vibe,” Longoria said. This pushed Longoria to make what he called the “best decision of his life” and choose an independent gap-year program, allowing him to have a job and work on passion projects before college. Longoria quickly found a job at Rizeup Capital, a private investment group in Sacramento that specializes in the educational sector. Longoria said the firm has given him, an aspiring business major, ample experience. When Longoria comes to work, he turns on CNBC to check the stock market and discusses it with his CEO. He said he’s also involved in the company’s investment plans. Although Longoria said he has enjoyed working on these projects, he does miss school. Chiu, a Japan native who moved to Sacramento when he was 5, said his gap year in Tokyo has been stressful. The entrance exams begin in April. Chiu is applying to four schools and must take a separate exam for each one. His top choices are Tokyo University and Tokyo Medicine and Dental University, as he plans to major in medicine. To prepare for these exams, Chiu enrolled in a “cram school.” Chiu attends class from 9 a.m. to 6 p.m. on Mondays, Tuesdays, Fridays and Saturdays and from 9 a.m. to 10 p.m. on Wednesdays and Thursdays. And he doesn’t take Sundays off. “On Sunday when I don’t have school, I try to study about 10 to 12 hours,” Chiu said. Chiu said he studies so much because he always wanted to attend university in Japan. Longoria chose a very different word to describe his gap year. When he has a light day, he edits his YouTube videos or records his passion project — “The Jake Longoria Podcast,” which he started as a senior while on the Octagon. Longoria does behind-the-scenes interviews with business, sports and education executives. Longoria’s gap year took an exiting turn on his trip to drop off his brother Bryce Longoria, ’18, at New York University. Jake Longoria had just gotten a new camera and wanted to film his experience in New York to make a vlog for his YouTube channel. The first surprising event during Longoria’s New York trip was meeting someone who worked for rappers Migos and Drake at a hotel. Longoria said the employee asked if he wanted to take photos of their tour. “Unfortunately, I’m not a photographer, so I declined,” Longoria said. Longoria said he spent the rest of his trip filming and editing his vlogs. On the second night before he was supposed to leave New York, he witnessed an odd scene. “This guy comes in with his friends, and the lady at the front desk is struggling to get them in,” Longoria said. “She asked if he used the right account when making his reservation, and the man said that he has three accounts. Bryant, a wide receiver for the New Orleans Saints, asked Longoria if he could be in his video, and Longoria agreed. After that, Longoria said Bryant invited him to the launch of “NBA 2K19,” a basketball video game, the next day. “I met great people there who I still talk to, like Lonnie Watson and Rob Martin, the creators of the fashion company Astoic,” Longoria said. 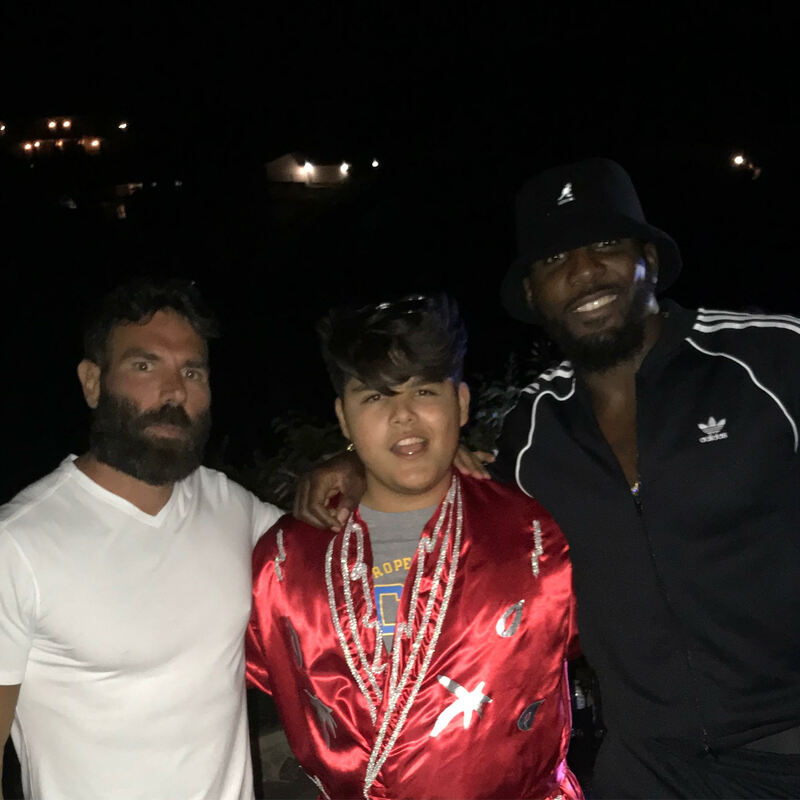 While it might seem surprising that a celebrity athlete would befriend a teenager so quickly, Longoria said he wasn’t surprised. Now, Bryant follows Longoria on all his social media accounts and has put Longoria in charge of all social media and multimedia for Bryant’s new company, Personal Corner (PC), soon set to launch. PC is a way for fans to connect with celebrities on a more personal note with an online currency and prizes. The company’s beta should launch soon. Through all this, Longoria said he has gotten close to Bryant. Longoria went, which allowed him to attend a Halloween party in Bel Air as well as a birthday party for Cleveland Browns wide receiver Odell Beckham Jr. (OBJ). “OBJ’s definitely an entertainer, but he is low-key and was enjoying his party,” Longoria said. Longoria also said he met James Corden, the host of “The Late, Late Show” on CBS. “No one was confident enough to go dance with him or hang out with him,” Longoria said. In addition to meeting celebrities, Longoria started a company called NoBrakes that sells premium athletic apparel and will launch its first line this spring. “Our business model is going to follow Gymshark’s, which stayed with a small circle of influencers,” Longoria said. Longoria hopes to outpace that. “If in six years we’re doing more than them, I’ll be content,” Longoria said. Longoria conceded that lots of money flows back to the company. “Lululemon is now an $18 billion dollar company, so you’re looking at a growing industry,” Longoria said. Nike and Adidas pay athletes to endorse their products, but Longoria will use social media influencers. “I spend most of my day working on NoBrakes, communicating with our manufacturers or trying to scout more talent,” Longoria said. Although Longoria likes working on NoBrakes, he said he likely won’t take another gap year. Longoria said he won’t decide until the end of summer and doesn’t know where he would attend college.